This is Miriam (forgive the camera phone picture – she is ever so much cuter than that – and less fuzzy). She is four and “three quarters” years old. 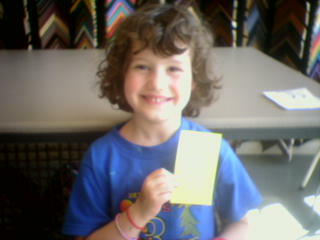 She’s holding a sticky note upon which she learned in about two seconds to write my name. I’ve been acquainted with her family for a year or so now. Read about her family and her brother Simon. Therein lies the perspective. Heartbreaking. It certainly does give perspective.